ACS1216A được thiết kế với kích thước nhỏ gọn chỉ 1U, có thể quản lý lên đến 512 servers. · One PS/2 console controls 8 computers. · Daisy chain up to 31 additional units - Control up to 256 computers from a single console. · Firmware upgrades to all the chained KVM switches at the same time via the daisy chain cable. · Buzzer ON/OFF via hotkey and OSD. · Broadcast Mode: Operations simultaneously performed on all selected computers, software installation and upgrading, system wide shutdown....etc. · Auto-sensing of station's position on daisy chained installations - no need for manual DIP switch setting - front panel LED indicates station's position. · Computer selection via hotkeys and OSD. 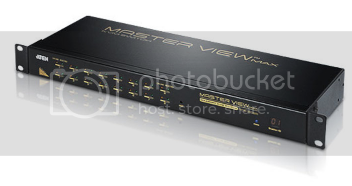 · Superior video quality- up to 2048 x 1536; DDC2B. · Rack mountable in 19" system rack. · Multiplatform support: Windows 2000/XP/Vista, Linux and FreeBSD. · For more information about KVMs which can connect to ACS1216A, see Compatible KVM Table.